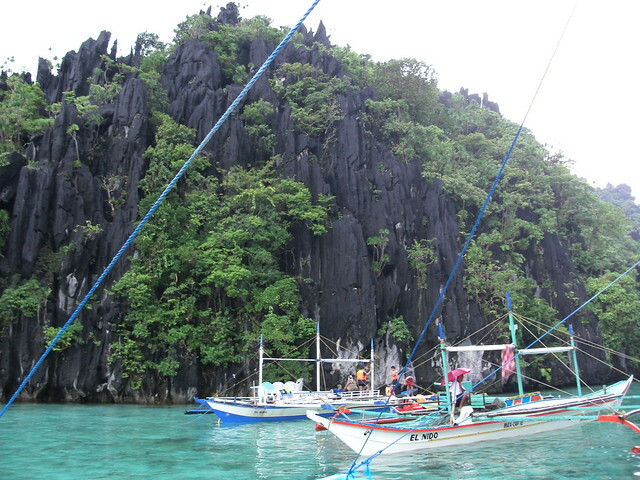 The Island Hopping Tours of El Nido is considered as the main reason on why tourists are visiting this part of Palawan. It is also the reason on why they don’t complain at all with the electricity shutdown (6AM-2PM). Who needs electricity when you’re in the beach anyway? One of my worries prior to my El Nido trip is the cost of Island Hopping Tours. In some places, passengers pay for the whole boat. While in bed, I was already planning my strategy on how I can convince other tourists to go on a tour with me so we can split the cost. I asked Kuya Larry of The Alternative Inn about the tours. I shared my concerns to him and he said that I shouldn’t worry since tour operators charge per passenger. Whew. What a relief. I was supposed to take Tour A on my first day. Only Tours A & B were offered due to the weather. While waiting for my breakfast, I noticed that my camera is acting up. I decided to just cancel my trip and just proceed the next day. With a new camera in tow and a brave spirit (what? LOL), I went to the booth of Servant Tours as referred by Kuya Larry. I also feel confident about this tour operator because I’ve read about it from Marky’s blog I met a British-Filipina couple and talked to them. I felt relieved upon learning that Ate Janice is Ilocana. This is a good sign! 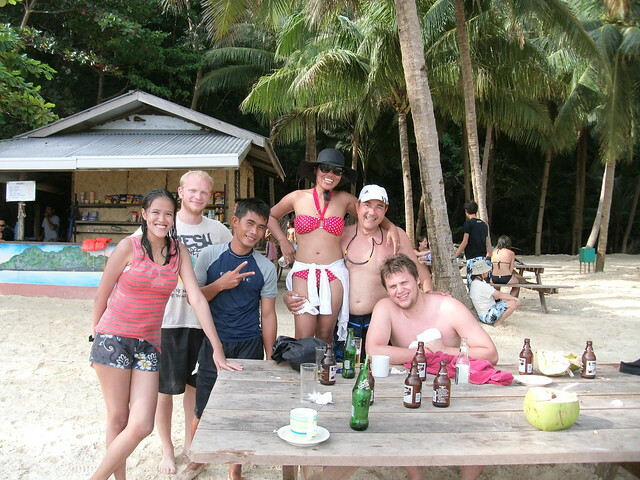 Later on, a family from Surigao joined us and two cool german guys (hello, Toby and Chris!). In short, I am the only solo traveler. I started talking to our tour guide so that I won’t feel out of place. TOUR A costs Php700 per passenger. We also need to pay Php200 for the Environmental Fee good for 10 days. The first part of the tour is a bit tricky. It started to rain a bit hard while we’re on our way to the first destination. The waves were really strong and the rain started to pour. I was just laughing while the rest of the passengers were sharing jokes. “Yes. Don’t worry, they know what they’re doing” I assured them. Our first stop is the Small Lagoon. It reminded me of our Coron Tour (Twin Lagoon). Since it is a mix of fresh and seawater, Ada had to pull or push me just for me to move. When we entered the Small Lagoon, a lot of tourists were amazed. I am also amazed with the view, but I want more sun to shine on us. None of us were able to take pictures. I started chatting with the family from Surigao. Our tour guide was insisting that they wear life vests while inside the Small Lagoon. I assume that the parents are in their late 50’s and the daughter is in her early 30’s. It’s nice to see a family in such tour. We were able to enter in a big cave. I heard someone speak in Ilocano and I smiled. I guess flights via Clark is a big push for Norte peeps to go on trips. I also took the opportunity to talk more to our tour guide. I told him that several bloggers blogged about Servant Tours. He mentioned Josiah and even confirmed that majority of the inquiries about their services were from blogs. They want to make a good impression by doing a better job in their tours. “Dapat wala na kaming turista ngayon, pero masaya kasi dumarami ang nagsusulat tungkol sa El Nido kaya maraming pumupunta dito kahit malayo.” he proudly says. “Ako nga talagang dinayo ko ito kasi na-curious din ako. 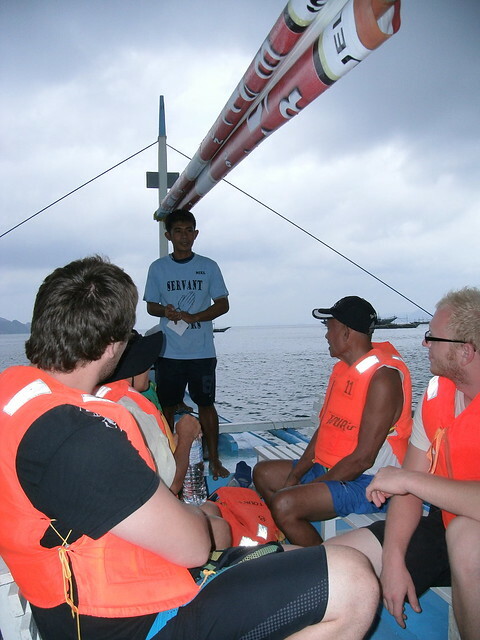 Buti na lang tumuloy ako!” I replied while we were on our way back to the boat. Our next stop is the Big Lagoon for picture-taking and sightseeing. Have you seen the movie The Bourne Legacy? The last scene was shot there! It can’t help but remember our Coron trip again. We also saw some people who were kayaking. Apparently, they’re guests from Miniloc Resort. I took some photos, but I sincerely wish my LX3 was with me. I am quiet the whole time as I am getting ready for my favorite part of the tour – LUNCH! Sunshine, thanks for coming with us in Shimizu Island! Our lunch stop at Shimizu Island is quite different from other tours I’ve taken in the past. 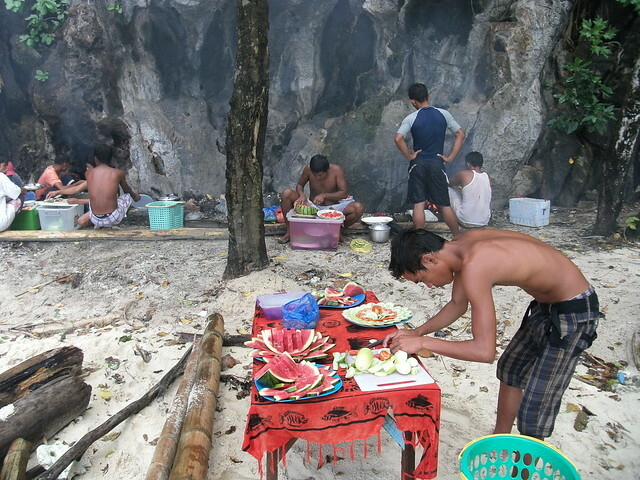 This time, tour guides and boat men transform into chefs as they cook food within the island! We had an hour to swim, talk and take pictures while on the island. Boatmen can be good cooks too! I am amazed on how they work hard not only with cooking our meals, but with the presentation. Bon Appetit! Our last stop is the 7 Commando Beach, where we were able to buy drinks and spend the sunny afternoon getting to know each other. It’s nice to exchange views with new friends. 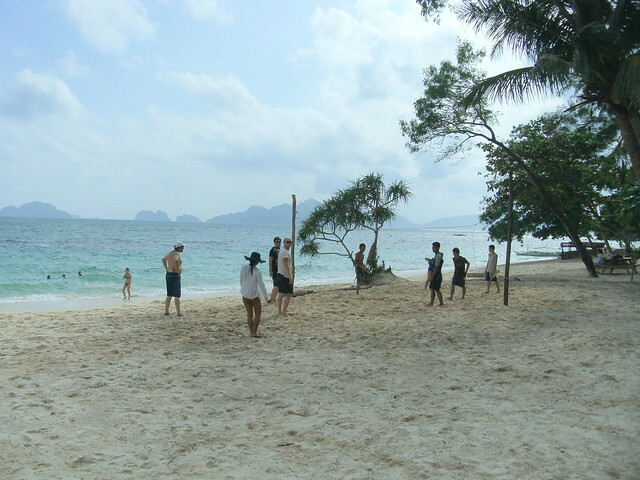 Later on, some locals approached tourists to join them and play volleyball. We went back to El Nido town proper with good memories in tow. We met up for late dinner at Mabuhay Bar and Restaurant. A live acoustic band performed too and my tour mates were glad upon hearing The Beatles and U2 songs that night. The night ended with us parting ways as friends. What a good start! Servant Tours : 0939-917-9443, 0917-808-8599 or 0915-415-7245. 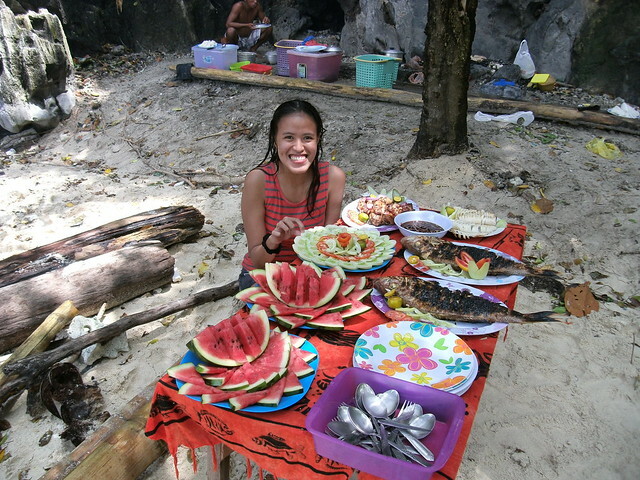 This really reminds me of the Coron island hopping tour I did with the people from Sea Dive Resort in Coron. What do you think is more beautiful, Coron or El Nido? 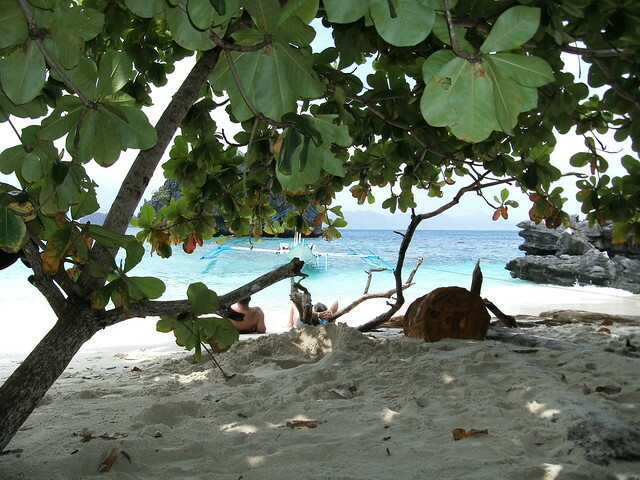 Many people tell me they like El Nido more then Coron, you think like that too? Let me know if you want some tips about Belgium or want someone to show you around. I’ll be happy to help if I can. Wow. Kakainlove talaga dito! I remember during our trip, I wasn’t able to take pics after the 4th destination kasi umulan at ang lakas lang ng alon. 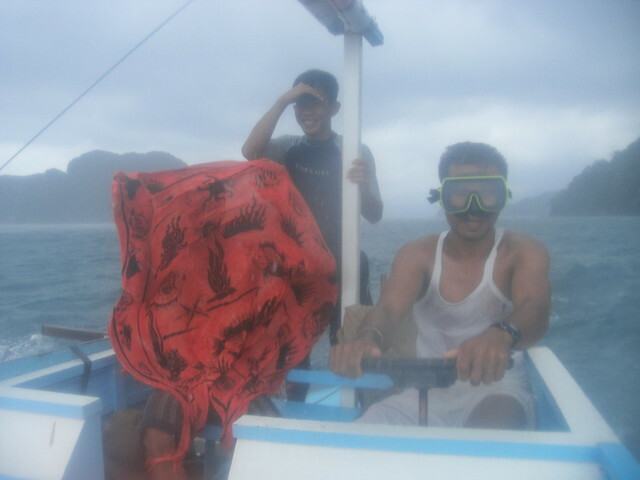 Gaya ng sa pic mo naka googles na rin kami pero tinago na sa compartment ng boat ang things namin for it not to get wet. Missed to capture 7 commando. Kudos! Ganda ng kuha. Yung biglaang nabili mo sa El Nido na cam ba ito? You came to El Nido, just after I left it. I got the urge to drop everything and go back.. hahaist! fat chance! But I think I make my El Nido sojourn every year from now on. I know how you feel, Francis! 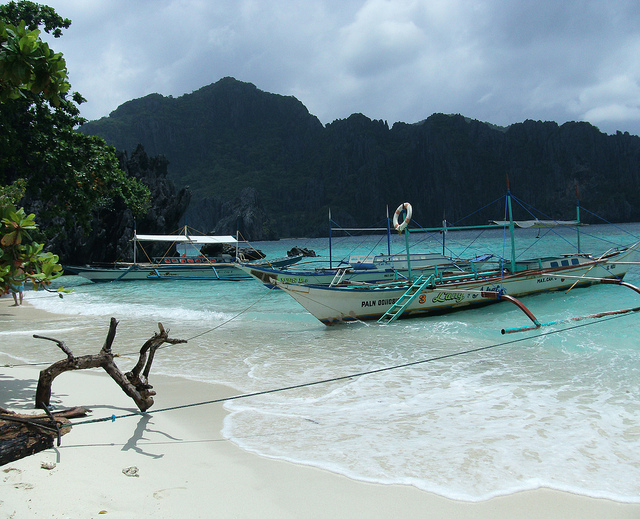 Hehe I wanted to take another van trip to El Nido and stay longer in this paradise. Pwede naman, pero hindi ko ginawa hehe. Tour C and Tour D is my next target on my return. Your post made me miss El Nido! I haven’t seen Bourne Legacy yet, but will look out for the Big Lagoon when I watch 🙂 I agree the boatmen’s food preparation/presentation for the island feast is superb! Thanks Kara! Buti pa sina Kuya marunong magluto hehe 😀 I’ll make a separate post about the lunch alone. Nakakamiss! parang there’s a sunshine after the rain.. mukhang enjoy after that heavy rain..
El Nido is one my favorite places in the Philippines. Ang tahimik na, sobrang ganda pa! Ang galing ng mga bangkero di ba? Nagtatransform as chefs at ang sasarap ng luto! Awts! So Tour A lang nagawa niyo? Wah babalikan ko yung Tour C! ha! i’d have this tour a in mind. i wan to go the commando beach on camo. 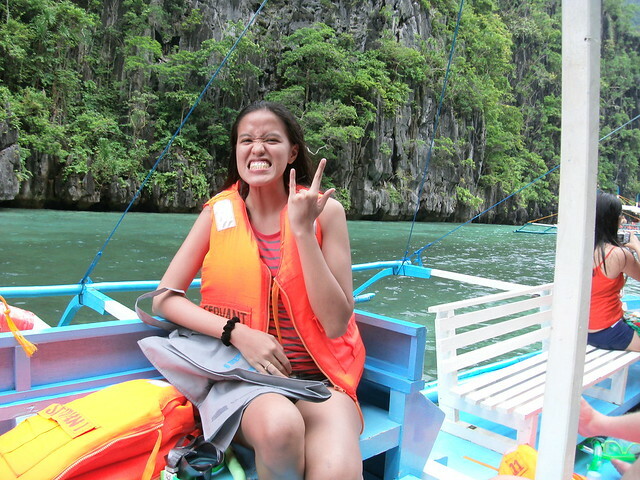 i’m sooooooooo excited for my palawan trip!!!!!!!!!!!!! i can’t help but scan all your articles in el nido. hihihi! Namimiss ko talaga siya super. Natuwa ako sa comment nung isang follower mo. Si Wouter. Nakaka-proud no? Ako din confused before kung el nido ba o coron ang mas maganda. I realized Coron pa rin talaga. kakagaling ko lang ulit 2 weeks ago. Pero sa totoo lang we don’t need to compare. Pareho silang maganda for me. At feeling ko pare pareho tayong uulit ulitin ang mga lugar na to. Ang saya! Kelan pa kaya kami makakagala sa Palawan, and we started worrying baka dun pa kami makagala pag touristy na ito. Hi Senyorita! 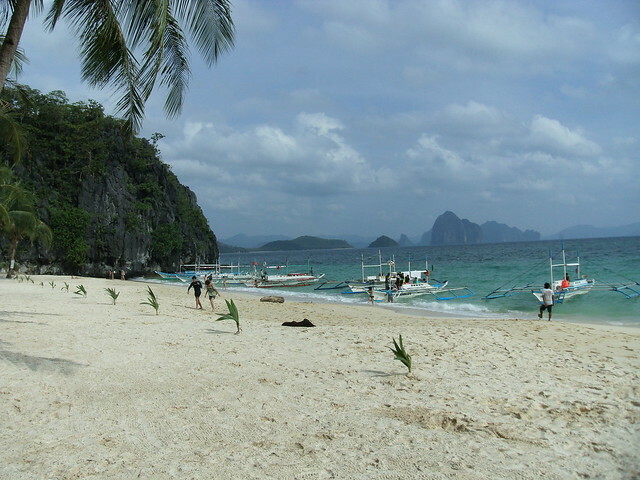 Thank you so much for your blogs about El Nido. This is just so informative and helpful especially for those who are planning to visit the place!